With the apparatchiks gone, Almaty has regained its wild swagger. A frontiersman Almaty guide to beds, bars, beer, yoghurt and even Guinness, in the former Kazakhstan capital. 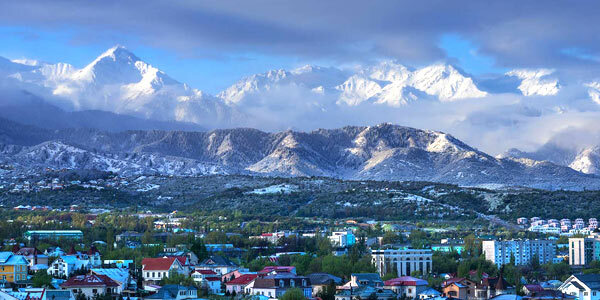 ALMATY, or Alma-Ata, proudly served as the capital of Kazakhstan until December 1997 when the Kazakh government abruptly decreed parliament be moved to the more centrally located and northern Astana. Suddenly orphaned, and abandoned by lock-step marching apparatchiks, Almaty blossomed. It remains in rude health and is undeniably the commercial and cultural heart of the country with the politicos and swagger moving north. Almost 10 percent of the country's 17 million population lives here, enough to enliven evenings and engage visitors with fine apples, beer and oddly retro music. So there we all sat, in a festively adorned tour bus headed for the neighbouring hills, listening to Christmas carols in the heat and dust of May. It about sums up that zesty no-holds-barred Kazakh spirit, and experiences like this will bring a smile to the face of the most harboiled of travellers. If you really want diversity and arrived in winter, hop over to the ski resort of Shymbulak (also Chimbulak, or Shimbulak - just pronounce it right to be understood), just over 7,000ft above sea level and 25km from Almaty, where the 2011 Asian Winter Games were held. There are three ski lifts, good slopes, and four-star accommodation. Anyone familiar with travel in Central Asia – as well as any Almaty guide – will tell you this is the most modern of the region’s cities, and not too far from Bishkek. Travellers from dustier Silk Road towns, expecting the same quaint winding streets or brash Soviet kitsch are in for a shock, albeit a pleasant one. Alma-Ata means “master of apples” and comes from the city's famed orchards. Those pastoral days are long gone and the orchards have, alas, been replaced by gleaming glass towers of 21st century capitalism and soaring Almaty hotels aimed squarely at well-heeled business travellers. The apples have moved farther afield these days but are still abundant. Visitors, pinstriped or laid-back, should have no trouble finding all of the amenities of home. The population of Almaty is young and hip and justifiably exuding chest-out civic pride. The hallmarks of typical Central Asia are, for the most part, completely absent here. Gone are the traditional tea houses and full-length dresses. Now expect trendy sidewalk coffee shops and miniskirts that may scandalise even jaded American values. Almaty is a real city even by the snottiest standards. Its wide boulevards are full of art galleries, boutique shops and sushi joints. Surprisingly for those accustomed to Central Asia, women drivers clog the streets and you would have to drive over an hour out of town to see a real donkey cart. Modern it may be but it is impossible to forget you’re in a Kazakh city. The public spaces are filled with monuments to the Golden Warrior astride a snow leopard with a headdress of gleaming arrows. The towering snow-capped Tien Shan mountains encircle the city to the south, and horse meat and beer snack platters are offered at every bar and café while retro music from the ‘60s plays clashing discordantly with modern schlock. Taxis are perhaps the only possible bargain you’re likely to find in Almaty. Did we mention the prices? Forget everything you've become accustomed to elsewhere as you travel through Kazakhstan, and get ready to open your wallet wide. The prices in Almaty are more comparable to Moscow than Tashkent. For everything from a cup of coffee to a bed for the night, you’ll be shelling out handsomely. Overall, Almaty is woefully ill equipped to handle budget travellers. Cheap hostels, budget hotels and guesthouses tend to cost as much as a mid-range hotel room elsewhere in the region and you can only live off kebab rolls for so long. If, however, you have cash to flash and are carrying suitcases filled with greenbacks and travelling on a corporate boondoggle, things perk up considerably. Almaty offers an impressive array of museums, restaurants, designer shopping haunts, verdant parks and lively clubs and bars for those in search of decent nightlife. Also, despite what everyone in neighbouring countries will tell you, Almaty is safe. Don't abandon your common sense but feel free to explore everything the city has to offer. On then with our Almaty guide and the best of Kazakhstan travel. Almaty's citizens take a great deal of pride in their public transportation. A confusing network of bus lines thread through the city along with a welter of routes for minivans, trolleys and trams. The bus system can be overwhelming but I found locals eager to offer guidance. Taxis are ubiquitous. Official cabs are everywhere, but as elsewhere in Central Asia, upon putting out your hand you as likely to be picked up by a private car as an officially licensed cab. Don't be worried by this. Private cars are every bit as safe and dependable as their official counterparts and often much cheaper. Twice my drivers refused to take any payment at all. Of course, this is unusual, but it may happen. When deciding on a price, don't expect your English to come in handy. 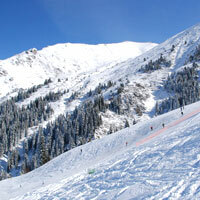 In fact, don't expect English to be of much use at all during your stay in Almaty. Although the region’s most modern city it is also its most Russified. A newer transport option are the bicycle taxis (three-wheelers) that ply short distances of a few blocks or more if required starting from about 200 tenge, or a little under a dollar. The city is spread out on an orderly grid and although on a slight slope, it is for the most part flat. With most things within striking distance in this modestly-sized city, it is great for walkers. The grid-like layout makes Almaty an easy city to navigate and, reassuringly, the mountains are always visible to the south, as is the national monument in Respublika Alanghy Square. The major shopping street, Gogol, is to the north. It is crammed with designer labels like Ferragamo. A fun way to get a feel for the city is to take a ride on the tram. It travels from the southeast of the city up into the hills, where it stops at the TV tower. This is a pleasant and novel way to see the city. The canned voice-over in the tram itself says "not only entertainment, it is art". The tram’s terminus is at a hill station in the shadow of the TV tower. There is a small rollercoaster, a kiosk selling pizzas, a smattering of fairground games, a beer garden and a restaurant. Oddly, even though the tram runs until 1am the restaurants and beer garden close after dark. I got up to the top just past seven and all that was open were the games and the pizza kiosk. The games are worth checking out and include the opportunity to fire large model cannons at targets. You can walk down and the jaunt is a lovely, albeit, long one or just hop back on the tram. My first order of business was changing money, far too little as it turned out. The exchange ratei s around 186 Kazakhstan tenge to the dollar (US$1 = KZT319). The currency black market found in other Central Asian cities is almost completely absent here and you’ll find a currency exchange kiosk on nearly every block with far better rates than at hotels. ATMs are everywhere as are branches of most major banks. After breakfast at one of Almaty's many charming sidewalk cafés, follow the locals and head to Panfilov Park. Kazakhs love a good park. Any bit of open space in Almaty, even a few yards of grass, will fill up with families and children relaxing and picnicking. 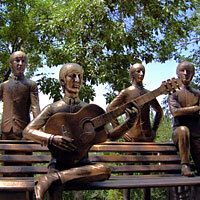 Paniflov Park is Almaty's largest and most impressive, located just northeast of the city centre and off Gogol Street. Paniflov covers a large area and encompasses many pleasant pathways, meadows and leafy groves. It is a great place to people watch, full of young lovers, old couples, wedding parties and happy children on skateboards. The centre piece of Panfilov Park is undoubtedly Zenkov Cathedral. 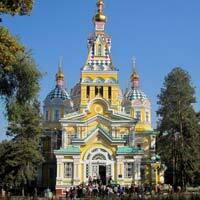 This impressive edifice is Almaty's answer to St.Basil's in Moscow. It is large, ornate and striking lemon yellow. 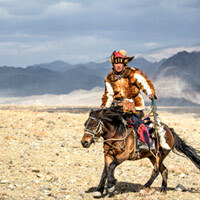 The front square area is always full of the usual crowd of happy Kazakhs as well as snack carts and horse-drawn carts. Just up the road from Zenkov Cathedral is the Panfilov War Memorial. This consists of huge, and overtly Soviet, statue of soldiers and a dais with an eternal flame. Like eternal flames elsewhere in Central Asia and Russia this one serves as a popular photo spot for wedding parties. I get the symbolism of the eternally burning flame of love but at the same time you may find the ebullient joy of the new brides and grooms next to the mourning visitors incongruous. After photos many of the wedding parties continue to the parking lot to blast Russian music from their cars, drink vodka and dance en masse. It is worth checking out. To the east of the memorial is another striking wooden traditional Russian building displayed prominently in many an Almaty guide. This is The Museum of Kazakh Musical Instruments. The building itself is worth a visit but the museum it houses is perhaps Almaty's finest. It costs KZT200 and has an extensive collection of Kazakh instruments. There is absolutely no English translation and as a result the narrative thread can be a bit hard to follow – what are those cavemen doing? Waiting for WiFi? Or fire? Frustratingly, there are no recordings of the instruments. Still, there are quite a few gems – like nomad bagpipes – in the collection. Although my favourite, The Museum of Kazakh Musical Instruments is far from Almaty's only museum. The two largest museums in Almaty are the Central State Museum and The Kazakhstan Museum of Arts. The Central State Museum is just off of the Respublika Alanghy and costs only around KZT100 to enter. It is in a huge Soviet era building and has an extensive collection of artefacts from throughout Kazakh history. The Kazakhstan Museum of Arts is Central Asia's Louvre and has a huge collection of work from artists both local and international. It is located in the south of the city across the street from the Hyatt Regency. The museum itself is massive and sprawling. If you want to really appreciate everything in the collection give yourself the better part of a day. The Soviet era elements of the museum seem the most popular with foreigners although I loved the work from modern Kazakh artists. The museum itself can seem a bit run down and it definitely has an odd streak. I perused an exhibit featuring paintings of tigers. The earth may not move for you here but he Geology Museum is another popular choice. While you’re in the south of the city visiting the museums be sure to swing by and check out the Respublika Alanghy. Before the capital moved to Astana this was the political centre of Kazakhstan. The square, surrounded by imposing government buildings, consists of a series of fountains moving uphill and culminating in an obelisk, The Monument to Independence. On top of the obelisk is the golden man, a Kazakh warrior riding a snow leopard. Surrounding the obelisk are several statues representing the Kazakh people. Just a few feet from the obelisk is a busy road so be careful when taking a picture. In fact, because of its great height and vicinity to fast moving traffic the Respublika Alanghy is perhaps one of the world’s most challenging monuments to photograph and, as a result, the only place where it is actually worth paying one of the camera toting vendors for a tourist portrait. Also south of the city centre is St. Nicholas Cathedral. 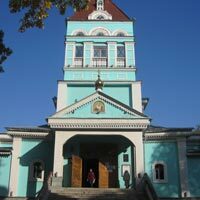 Be sure to take a peek inside this orthodox edifice as the painted walls, ceiling and icons are otherworldly. Ask anyone working at the cathedral if you can take pictures and they will assure you that you can but I still felt awkward taking out my camera and did notice a few of the faithful glaring. Use your judgment. Aside from things to see Almaty shopping presents a number of distractions. Those looking for bargains, or hoping to find indigenous Central Asian handicrafts might be disappointed but people whose taste runs more towards Prada will be in designer-label heaven. The major shopping street of Almaty is definitely Gogol Street, which runs east to west in the north of the city centre next to Paniflov Park. Here you'll find boutique shops from many (if not most) of Europe’s and America's most famous brands. Also, available are smaller local Kazakh fashion brands as well as Russian labels. Just above Gogol is Zhibek Zholy. This street is less developed than Gogol but about five or six blocks of it have been designated pedestrian-only. The first couple of blocks are taken up by a farmer's market and then the rest of the road becomes a cross between a European promenade and a flea market. The farmers’ market is filled with produce of every description including locally made honey and the best yogurt you will ever taste. It is also a good place to people watch. Kazakhs come into town from the countryside to sell their produce here. For more people watching, the other pedestrian blocks of Zhibek Zholy are good spots in which to gawp at Almaty's youth flaunting their chic fashion tastes. Oddly absent in Almaty are the bazaars that are such an integral part of other Central Asian cities. There is one bazaar in the city itself. This is Zelyony Bazaar. Compared to the major bazaars of other cities in the region, the Zelyony Bazaar is tiny, but its size makes it manageable. Although it mostly sells food, it is still well worth a visit and won't take long to see. Our Almaty guide certainly doesn't slow down after dark. As the sun sets the streets fill with young people drinking beer and eating ubiquitous tortilla-wrap kebabs. Almaty nightlife is arguably the best in Central Asia. No question. It even draws big-name DJs. For those who have sampled Russian discos there will be no surprises here. The club scene in Almaty is in constant flux as kids in Almaty are famously picky. Ask a local which spot is hot at the moment. Although pounding on weekends, the Almaty nightclub scene is pretty much dead during the week. Do not despair. 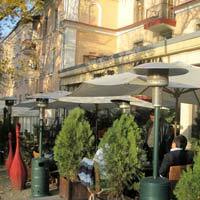 Almaty has a vibrant bar culture. Try Queen’s Pub & Strip, the Cuba Bar, or the SOHO Club (that attracts worrisomely mixed reviews and shady patrons). Although in most Central Asian cities drinking takes place in restaurants or in parks, those looking to imbibe in the Kazhak capital will have a wide variety of watering holes to choose from. The city has everything from wine bars to cocktail lounges and even a burgeoning gay scene. Thrilling then to discover the pubs. Guinness Pub is Almaty's largest and most famous spot for a pint of dark. On the other hand, many prefer Dublin Pub, which has a more homey feeling and is tucked behind the Republika Alanghy. The options for accommodation in Almaty are extensive and, unless you’re on a budget, you will have lots to choose from. The Rixos Almaty (almaty.rixos.com/) is a grand affair, right downtown at the intersection of Kabanbai-baty and Seifullina Street, around 13km from the airport. Expect a 25m indoor swimming pool, a Spa and fitness centre and gym with Turkish hammam, and a spacious ballroom for Almaty conferences and meetings. The rooms are ornate in a faux-classical-Euro fashion with space ranging from a 32sq m Deluxe to a 220sq m Presidential Suite where you can play out your Louis XVI fantasies. The Dostyk Hotel (www.dostyk.kz/en/) is also at the heart of town and well set up for business travellers. We looked at Hotel Uyut (Gogol Street 127/1, corner Seifullin St, www.hotel-uyut.kz, tel: [7-727] 279-5511), which has an excellent location. The hotel is clean although the beds are rock hard and the place charges almost US$10 an hour for the internet. At around US$123 a night, it’s not exactly cheap but expect a café that serves delicious food. Next door, as we discovered later to our immense chagrin, the Hotel Kazzhol (127 Gogol Street, www.hotelkazzhol.kz/en/almaty/, tel: [7-727] 250-8941 ), has better service, nicer digs, and all this at just over US$140 a night. Sadly the beds are just as hard. 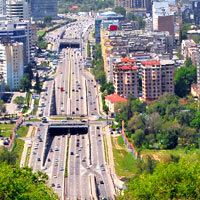 Near the town centre is the huge Alma-Ata Hotel (85 Kabanbay Bytyr Street, alma-ata-hotel.almaty-hotel.com). This Almaty hotel is apparently very popular with Russian (mostly drunk) businessmen. It is unabashedly Soviet-style and almost no English is spoken. Also, the US$100 to US$200 a night room charge seems unreasonable for the depressing rooms. The singles are especially grim. Also in this price range, with rooms starting at around US$129, is the City Hotel Tien-Shan (151 Quanaev, otel-tien-shan.kz/, tel: [7-727] 383-0599). This hotel has undoubtedly the comfiest beds in its price range and also very nice bathrooms. It has its own restaurant and offers 24-hour room service. If you are staying over the weekend (including Friday) you can take advantage of the special weekend discount rate of around US$80 per night. The massive Hotel Ortrar (73 Gogol Street, hotel-otrar.almaty-hotel.com/) has been less than successful in shaking off its Soviet aesthetic, but its location can't be beat. It is right across from Panfilov Park and right in the midst of Gogol's swankiest stores. Also there is an ATM and an Air Astana ticketing office in the lobby. All that aside, at US$200 a night, the price is rather steep for the matchbook-size rooms. For about twenty dollars extra you can upgrade to a business room, which is just like a normal room but comes with free laundry service for two garments, two hours of free sauna time, and one hour of free Internet each day. The best Almaty business hotels are the new The Ritz-Carlton, The Tyan Shan Grand, the former Hyatt Regency (now Rahat) and The InterContinental. The Grand Hotel Tien Shan Almaty (115 Bogenbay Batyr, www.ts-hotels.kz, [7-727] 244-9600) is the Hotel Tyan Shan's swanky cousin and neighbour. At around US$200 a night the price is almost double that of its cheaper sibling but the rooms are almost identical. The only discernible difference is the addition of some wood panelling in-room, better toilets, and one of the nicer spas to be found in Almaty. The 285-room Rahat Palace Hotel, formerly the Hyatt Regency (29/6 Akademic Satpaev Avenue, rahatpalace.com/, tel: [7-727] 250-1234) is Almaty's original five-star hotel. The rooms, many with nice mountain views, start at US$425 and run all the way up to over US$2,500 for the roomiest suites. Although undoubtedly five-star, it seems a bit run down and lacklustre by Hyatt standards. Still, service here is without equal in the city. Also expect a good health club, spa, and an indoor temperature-controlled swimming pool. Pick a south facing room on a high floor for the best mountain views. Prices are steep for the suites but you can try your luck with the suites. Newer kid on the block The Ritz-Carlton, Almaty (Esentai Tower, 77/7 Al-Farabi Avenue, www.ritz-carlton.com, tel: [7-727] 332-8888) arrived with great pomp and circumstance in November 2013. Perched atop the 37-floor Esentai Tower, this swank hotel offers 145 rooms filled with the latest mod cons. With smart rooms starting at US$305 a night, you’ll find ample chic elbow room and facilities on par with the best in Central Asia. 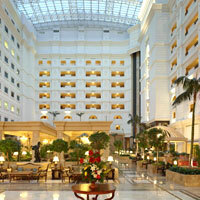 The InterContinental (181 Zheltoksan Street, www.ihg.com, tel: [7-727] 244-9699) is a very pleasant and briskly-run hotel. It was fully renovated in 2008 and positively sparkles. Prices at this Almaty hotel range from about US$518 to a whopping US$3,650 a night but with a Mediterranean restaurant, an Asian cafe, two bars, its own patisserie and the comfiest bed in town and satellite TV to gawp at, you definitely get what you pay for. The Club InterContinental lounge is on the 10th floor with the usual flowing canapés and drinks. Expect a high level of service here. The InterCon is next to the Presidential Palace and close to Zenkov Cathedral. 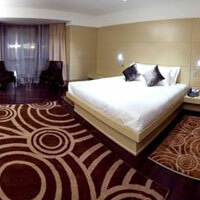 It is undoubtedly one of the best Almaty hotels around. After all, you will be in need of a serious lie-in after all that backbreaking deal-making, clubbing, shopping, bar hopping and taxi haggling. Also swank and upscale with a stab at design in the ski area, is the art nouveau Donatello Boutique Hotel (donatello-boutique-hotel.almaty-hotels.ru/en/), just 8km from the town centre and 20 minutes from the international airport. Yes, you'll find steam baths, sauna and massage to soothe those aching limbs after calorie-burning runs on the piste. Just don't forget your wallet.